Is it possible to up the limit on how much Eons we can carry? With the increased rates, 2,000,000,000 is not enough. Needs to be 100x that. 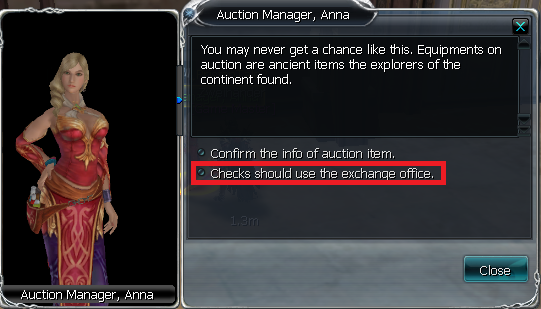 there is the option "Checks should use the exchange office." Then you can create the "Check" item from 10,000,000 of Eons by selecting the option "Eon -> Check", and if you decide to exchange for Eons again, just select the option "Check -> Eon". This NPC will only charge you 1% to do this process, but it will greatly help in storing Eons. Forgive us, but what would be the problem? So for instance. There are a few items in the game that are worth more than the 2kkk limit that we are allowed to hold. So if we put that item for sale in the buy/sell NPC, or if we open up a Selling shop on our character, we cannot put the item up for sale for more than 2kkk (limit). Maybe it’s worth 5kkk or 10kkk. Though it’s a rare instance as not many items are worth that much, it would still be convienient to raise the limit to 10kkk-20kkk. If you don’t understand i can take pictures later and elaborate. Yes, now we understand your point of view / report. However, it does not make sense to have such a high limit for Eons mobility within the game and so there is a conversion system in "Checks", so they can be used as exchange coins, since each is worth 20KK. In any case, your recommendation will be reviewed as soon as possible.